It was just an ordinary garbage dump on peaceful Cape Cod. No one ever imagined that conditions were perfect for breeding, that it was a warm womb, fetid, moist, and with food so plentiful that everything creeping, crawling, and slithering could gorge to satiation. Then a change in poison control was made, resulting in an unforeseen mutation. Now the giant mutant cockroaches are ready to leave their nest—in search of human flesh! 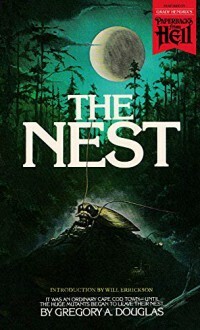 Following in the footsteps of other “animal attack” classics like Jaws and The Rats, Gregory A. Douglas’s shocker The Nest (1980) is an ’80s paperback horror classic and was the basis for a 1988 cult film adaptation. This edition features a new introduction by Too Much Horror Fiction blogger Will Errickson. Who would've guessed that face munching cockroaches could be this boring?